Skylar Brandt and Julian Mackay dance Flames of Paris. Vladim Shults, Courtesy Russia-K. When American Ballet Theatre soloist Skylar Brandt's phone lit up with a message from Julian MacKay last summer, she never could have imagined the journey it would set her on. Brandt barely knew the Mikhailovsky Ballet first soloist—they'd met briefly in St. Petersburg a few months earlier—but he wrote that he had a project he thought she'd be perfect for. Brandt was flattered, but assumed she'd be unavailable. She'd just come off an eight-week season with ABT and was in Los Angeles finishing up a tour. But MacKay was insistent. The next morning, Brandt was brushing her teeth when his sister, Maria Sascha Khan, called. "She explained that Julian was in Paris rehearsing for a Russian TV show called 'Big Ballet' and his partner had gotten injured. She asked if I could come to Paris immediately, as the show started filming in Moscow in one week." 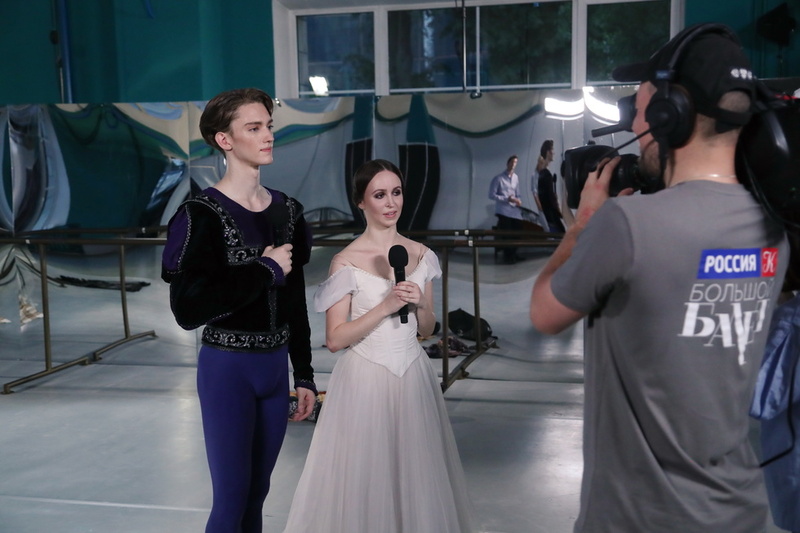 First broadcast in 2012, "Big Ballet" is a reality show airing on Russia-K, one of the country's two state-run channels, that follows couples from Russian companies through multiple stages of competition. As ballet is beloved in Russia, the show is wildly popular. "It's their version of 'So You Think You Can Dance,' but it's much bigger," says Brandt. And unlike most American reality shows, it doesn't dwell on interpersonal drama, but stays focused on the art. Khan explained that the show would make Brandt a celebrity in Russia—and then asked that she make her decision in one hour. Brandt and MacKay reflect on the judges' comments after dancing Giselle. It wouldn't be easy. Brandt would have to perform pas de deux from Giselle, Marguerite and Armand and Flames of Paris as well as Sébastien Bertaud's Renaissance and Kirill Radev's At the Sunset. Of the five, she only knew one. All she had with her in L.A. was a small suitcase carrying three leotards and two pairs of pointe shoes. Though she would be entering the show as a noncompeting partner, she would still be dancing on television for millions of people with only a handful of days to prepare. She was torn. But then Brandt remembered that when applying for a Russian visa last spring, she had requested a three-year reentry visa on a whim. "I knew very few details, but it sounded like a once-in-a-lifetime opportunity," she says. "I realized it was meant to be." Two days later, after a 12-hour flight spent studying videos of the works, Brandt landed in Paris. She headed straight into a five-hour rehearsal with MacKay. "I couldn't think about how jet-lagged I was," she says. She felt prepared for the challenge by her years with ABT. "I'm used to being thrown into things. I was only given four days' notice for my first full-length ballet with the company," she says. After three days in Paris, the pair flew to Moscow. Filming took place at Mosfilm, the city's largest movie studio, on a set complete with a stage, jurors' panel and seating for an audience. "It was just unbelievably hard work," says Brandt. "We rehearsed each of the pieces two or three hours a day." Though MacKay had a coach with him, Brandt often felt that she was on her own. The language barrier also proved challenging, since the entire show was in Russian. "I tried to pick things up visually," she says. MacKay, who is bilingual, helped her get by. Finally, after two weeks of filming, she was done. Brandt feels transformed by her whirlwind experience. "As ballet dancers we're always handling things under pressure, but this was on a whole new scale," she says. "I'm excited to continue to take on new challenges and just say yes." While the rest of the competitors experienced the show's impact firsthand, because Brandt lives in the U.S., she feels like it has taken place in a vacuum. She watched the show, which aired through December, online. "I think it'll be cool if I go back to Russia someday," she says. "I wonder if there'll be any inkling of recognition."